Looks like him to me. Dreadlord! Well, considering we just got two bruisers who they intended to be tanks, Mal'Ganis will probably end up being a perfectly respectable maintank who gets matched exclusively against Artanis and Sonya. Thats like the bulky cousin you dont want to talk about. 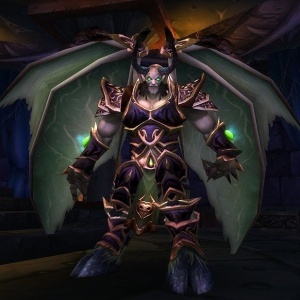 Mal'Ganis seems like a good hero so far. That blind ability is going to be hilarious. The CC stunlock set seems way overpowered though, will be some fast nerfs. So the tease with the minions seems like more of a distraction in hindsight. I still think that's a viking skin. How is everyone liking the new team league? It feels less competitive than hero league for me at the moment, but I am trash tier (silver/gold). On the other hand, there are less first pick Butchers and Novas. My group of friends love it. The best part to me is no pick order in draft. It feels bad going back to Unranked or HL and being forced to pick at whatever position you get put at in the draft order. Is there a reason AI Healer teammates never heal me? Simulating how typical players play. Cool, but I’m still waiting for some Classic Blizzard characters (read: pre-Warcraft) to make it into the game, as The Lost Vikings feel a bit out of place for being the only hero unit with that distinction. Give me Kyle Blackthorne already! solo queue Team League? What are you referring to here? My experience has been 30 second Team League solo queues, 10 minute Hero League queues. yeah team league has been way faster Qs for me but I've been losing so much I now Q into silvers which is low even by my HL standards. Mal'Ganis is super fun and also appears to be fairly good. Anyone else dove in with him yet? He's gonna get some kind of nerfs. Hopefully not too heavy til we see if players are going to start countering his relatively easy to counter abilities at a higher rate and dropping his winrate. His Carrion Swarm ult needs to be hit for sure with a reduction of healing. I wonder if his CD's will get touched too on his basics as they are pretty quick. As people recognize that his Q, his E, and both ults can be stunned or interrupted with knockbacks, though, his winrate should level off or begin to drop even before that stuff. Just remains to be seen whether people will adjust or not. If they hit him hard with the nerf bat and then people adjust as well, he'll be like Chen. If they nerf him lightly to start and add to it if they need to til people start to adjust, he might still be a decent hero. Mal'Ganis is stupid strong with a competent healer. Mobility, hard CC, Self-Healing, Tankiness, Decent Damage and no skill shots. Low Skill Ceiling + Strong kit is making him a monster right now in Quick Match. Malganis is harder to kill right now than Chogall tbh. 3 escapes on a tank with that much healing and CC is kinda obscene. Mal'Ganis needs to be balanced. He's a really strong hero, slightly overtuned, but i don't believe he's broken. Played with 3 friends tonight. Granted this is Quick Match, not organized ranked play. But I think he is really strong in unorganized play right now. Our MT picked him and was having a field day. I just played a few quick match games (as Ana) and won/lost 50/50 with Mal'Ganis. That said, I only played four games and the losing games also featured the same particularly bad KT on DPS. I don't find him too bad to play against in HL (and if you lack counterplay to a last-pick you probably drafted bad). You can just look at his win rate on Hotlogs and see that he's overtuned right now. 57% WR, he'll get nerfed for sure, but he's far from the most broken hero released even this year. Maiev was rocking like a 65% WR. I like how tyrande works now. Cleanses for days. Yeah, StormSpy has him sitting at 58% winrate in HL/TL, which is pretty high. I suppose I mean that Mal'Ganis is easier to counterplay in organized drafts than some other overtuned-on-release heroes (Maiev, Fenix). Malganis nerfs are live. Pretty sensible nerfs although not much actual talent changes going on. Played against him a lot today and he seemed to die much easier and in general wasn't going as ham in games. Kinda disappointing that they only showed one new hero this year, instead of 2 or 3 like in previous years. Orphea looks nice though, the animations on her attacks are awesome. And we finally got Janitor Leoric! Orphea looks really cool. Her animations look so good! She's definitely a hero that I'll be getting. On the other hand, the reception to the new gameplay changes seem pretty negative so far. I'll withhold judgment until I actually play the game with the changes, but a lot of folks are doom and glooming over the XP and catapult changes. Apparently the panel host didn't have an answer for how towers of doom works now. if it's the same as before w/ no XP gained there's no advantage from taking a bell tower unless you can immediately follow it up w/ a camp or an altar. In that case the best strategy might be to leave them so low you can convert them right before an objective. Forts still give some amount of XP there. It feels bad and will be very hard to explain to the average player that one map functions totally differently than others. This is a mistake I think. The XP gain is largely invisible and ends up a wash most of the time when both team trade a fort back and forth. It's not a big deal. Ehhhh I think its a problem personally, but maybe I just need to play with it to understand.